Movement conservatives are understandably (and even commendably) apoplectic with the rise of Donald Trump, who has appealed to the right-wing id without grounding his campaign in right-wing thought. But Trump’s flamboyant grossness, which disdains ideas altogether, has served as a distraction from the reality that those ideas themselves are often completely unserious. That is, they do not merely reflect different value judgments held by liberals — which they do — they rest upon easily refutable untruths. The other day, I pointed out that even leading conservative intellectuals who find themselves aghast at Trump, like Commentary editor John Podhoretz, still reside within a right-wing thought bubble, unaware of obvious facts that refute their preconceptions. National Review’s Jim Geraghty rises to Podhoretz’s defense, but serves only to underscore my point. If the stimulus were a success, Democrats would be running on enacting another one, and they would be using the term “stimulus.” The president’s advisors contended that with the stimulus, unemployment would peak at 8 percent and steadily decline. 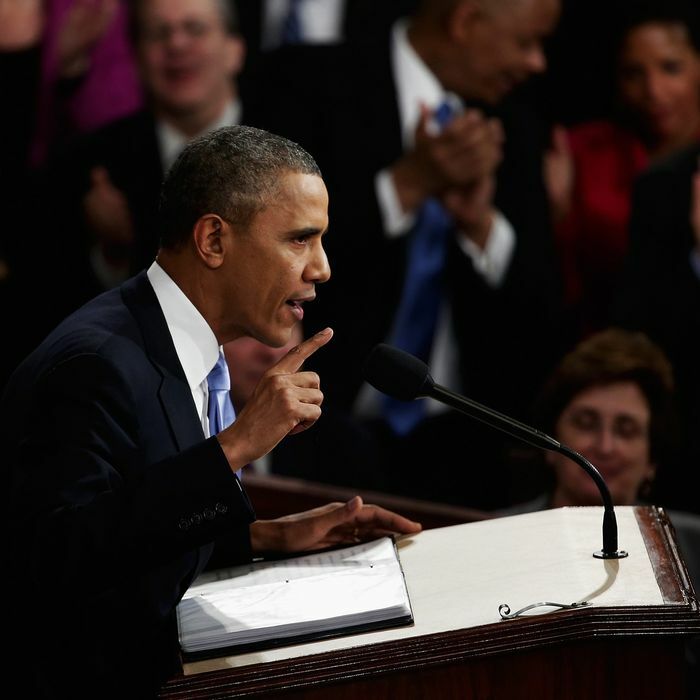 It hit 10 percent remained above 8 percent for almost all of Obama’s term. Bernie Sanders’ stump speech is a portrait of unending American economic woe, particularly among minorities and young people. The poverty rate and median wages haven’t budged. Almost 80 percent of voters say the country is still in recession. If overwhelming number of voters feel like the recession never ended more six years after the stimulus passed, why is it “pretty crazy” to contend the stimulus “did almost nothing”? Geraghty makes two arguments here. Argument No. 1, elucidated in his first, fourth, fifth, and sixth sentences, is that the stimulus is unpopular. Democrats don’t use the word stimulus, and one of the Democratic candidates — the self-identified socialist — is portraying the economy as poor. This is persuasive only if you consider public opinion infallible. Geraghty does not consider the oft-stated hypothesis, advocated by supporters of the stimulus in particular and the administration’s economic agenda in general, that Obama’s policies spared the country a deep depression without (yet) producing rapid wage gains that would produce widespread optimism. That Americans still feel dissatisfied with the state of the recovery may be evidence that the stimulus did not produce late-Clinton-era prosperity, but it is not evidence that the stimulus “did nothing,” since it does not consider the counterfactual scenario. Geraghty’s second and third sentences repeat an old and especially insipid Republican talking point: The stimulus failed because the administration’s economists projected it would hold unemployment to 8 percent, and unemployment actually topped out at 10 percent. This is clearly wrong because the source of the error is entirely due to the fact that the administration’s projection reflected official estimates at the time that massively underestimated unemployment levels. 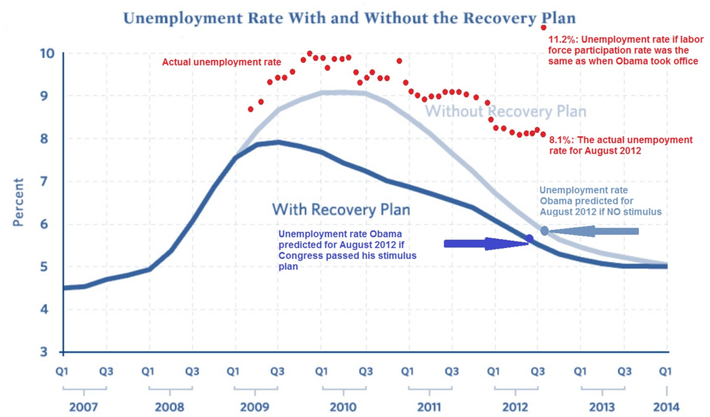 As we now know, but did not know at the time, unemployment was already at 9 percent when the stimulus was passed. So of course the stimulus failed to hold unemployment below 8 percent — that would have required going back in time. As I noted before, we can’t prove that the stimulus reduced unemployment because we can’t measure exactly what unemployment would have looked like otherwise. But the talking point that the stimulus failed because unemployment exceeded the forecasted level is not a serious argument. No reasonably informed person could take it seriously. And yet this blunt and easily refuted bit of propaganda continues to circulate seven years later within the airless bubble of the conservative echo chamber.